Our mission is to serve as a trusted resource for insider information and tips on Western North Carolina for visitors and locals alike. We highlight and promote area destinations, attractions, and resources to celebrate and preserve the region’s natural and cultural beauty. RomanticAsheville.com is locally-owned and operated by an Asheville based team passionate about the region. Originally founded in 2003 by Mark File to help couples plan a romantic getaway to Asheville, the site is now an 800+ page online guide to 16 WNC counties operated by new owner Justin Belleme and a team of dedicated professionals. The website received 5.5 mission visits in 2018 from 205 countries! You certainly don’t have to be a couple to benefit from this comprehensive insider’s guide to the mountains of WNC... many singles, friends, and families use it to plan their visit and locals rely on its depth of information as they explore their own backyards. 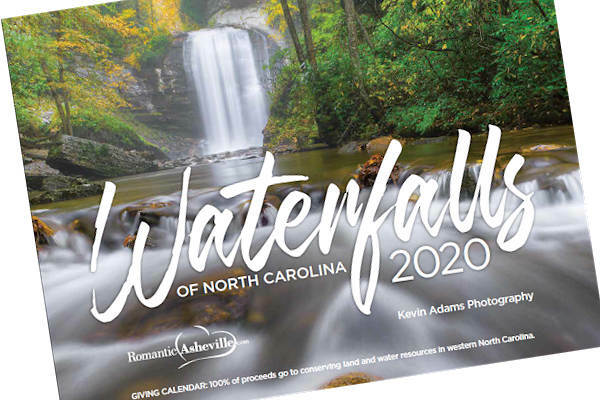 Each year, RomanticAsheville.com gives back at least 25% of revenue in paid and in-kind sponsorships to 200 non-profits in tourism, arts, heritage and environment. From our annual Giving Calendar fundraiser for land conservancy to special campaigns to restore trails or buy fire equipment to fight wildfires, we appreciate your support! 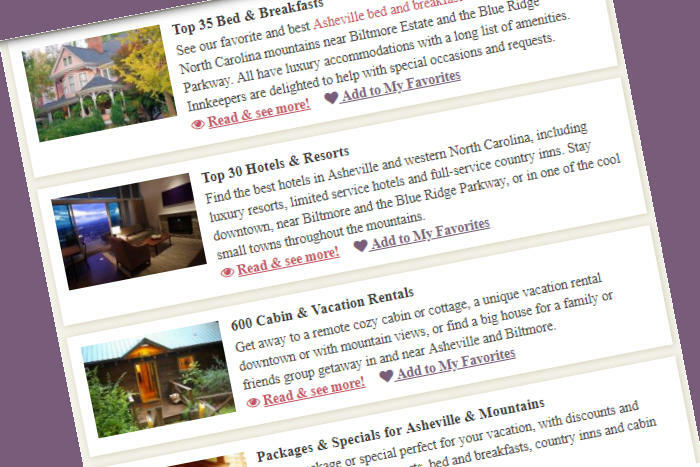 RomanticAsheville.com is a constant work in progress, updated almost every day and new features added frequently. There's never a shortage of new places to discover. Due to our passion of exploring the mountains, the outdoors section is the biggest on the site with 130+ hiking and waterfall guides.Another favorite is Biltmore Estate. We are on the estate every month, and RomanticAsheville.com now has 20+ pages about Biltmore. Likewise, we never tire exploring the Blue Ridge Parkway. Suggestions and corrections are appreciated! There is so much happening in the Asheville area, so it's easy for us to miss something. Please contact us. If you’re interested in partnering with us to tell our readers about your location, attraction or business, email our Partnerships Manager, Mark Collins. 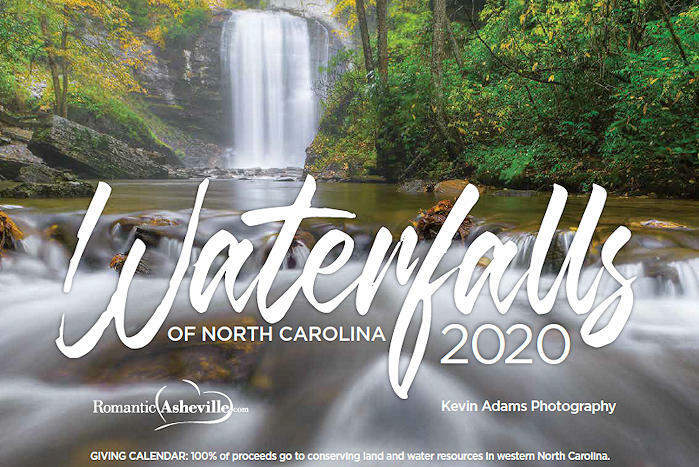 The 2020 NC Waterfalls Calendar will expand to benefit five land conservancies (read more). Our 2017 & 2018 calendar fundraiser raised $30,000 for the great work on the to the Blue Ridge National Heritage Area. The Giving Wall Calendar 2019 benefited two land conservancy organizations. In August 2017, we partnered with the Blue Ridge Parkway Foundation to raise $12,000 for trail rehabilitation and repairs at Craggy Gardens on the Parkway. Read more. In response to the wildfire in the Lake Lure area in November 2016, we matched a GoFundMe campaign for the Chimney Rock Volunteer Fire Department and raised $5,555 for them to purchase equipment to help battle future forest fires. Our Community Partners Protecting the Mountains - Please Support! Designated by Congress in recognition of our region's unique character, culture and natural beauty, they protect, preserve, interpret and develop the unique natural, historical and cultural resources of Western North Carolina. Explore with their Blue Ridge Heritage, Music and Craft Trails. This 434-acre public garden is an affiliate of the University of North Carolina to cultivate connections between people and plants with gardens, trails and many special events and exhibits. This hard-working non-profit group raises money and coordinates projects to protect Pisgah National Forest (Ranger District) and help fund some much needed repairs. We are delighted to be a Founding Member! Primary fundraiser and trusted steward of the Blue Ridge Parkway, they preserve the past, enhance the present, and safeguard the future of the 469-mile scenic drive. Show your love and support of the Blue Ridge Parkway with their NC specialty license plate for your car. This regional non-profit spearheads the economic and environmental revitalization of the French Broad River and its tributaries as a destination for everyone to live, learn, work and play. Preserve the natural and cultural heritage in eight counties by conserving scenic landscapes, farms, forests, watersheds, biodiversity and wildlife habitat in eight counties east of Asheville, along with three major river basins of the Broad, Catawba, and Yadkin. Located in the heart of the Southern Blue Ridge, they protect the waters, forests, farms and heritage of the Upper Little Tennessee and Hiwassee River Valleys - conserving 25,600 acres. They partner with landowners and communities to permanently protect natural resources with agricultural, cultural, recreational, ecological and scenic value - with more than 20,000 acres in Alleghany, Ashe, Avery, Mitchell, Watauga, Wilkes and Yancey Counties. 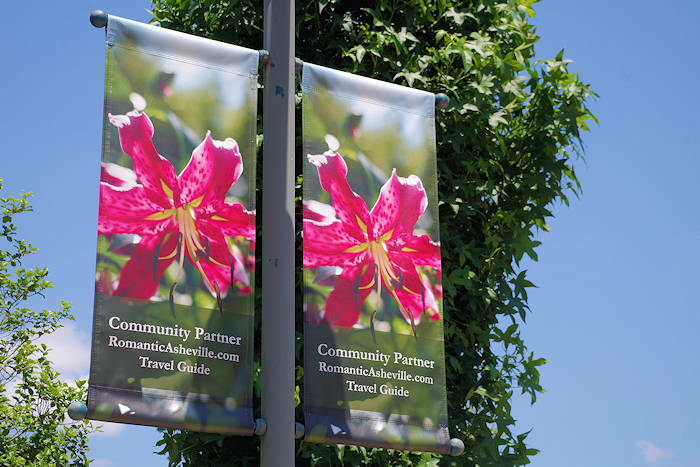 The officially designated marketing partner of the Parkway, they are a membership organization that publishes the Blue Ridge Parkway Directory & Travel Planner each year. 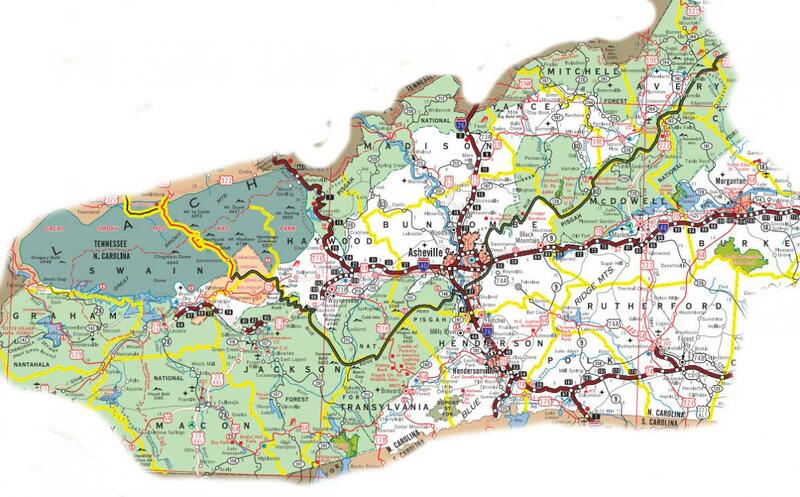 Our Region: We now cover 16 WNC counties! Sign up for our free monthly ENews. Follow us on Facebook and Twitter and Pinterest and Instagram. Learn about featuring your business on our travel guide. Become a RomanticAsheville.com Advertising Sponsor!